Our Association stands tall on the shoulders of thousands of higher education professionals who have shared their passion for student success in support of NASPA. From a meager start where just six people came together a hundred years ago to a nationally-recognized community of thousands, we have forged an organization centered on developing the future of our country, and our world. Explore the stories we've gathered here. Discover those who deserve to be honored. Find inspiration for what your future can hold. The idea of a gathering of deans of men is first documented. 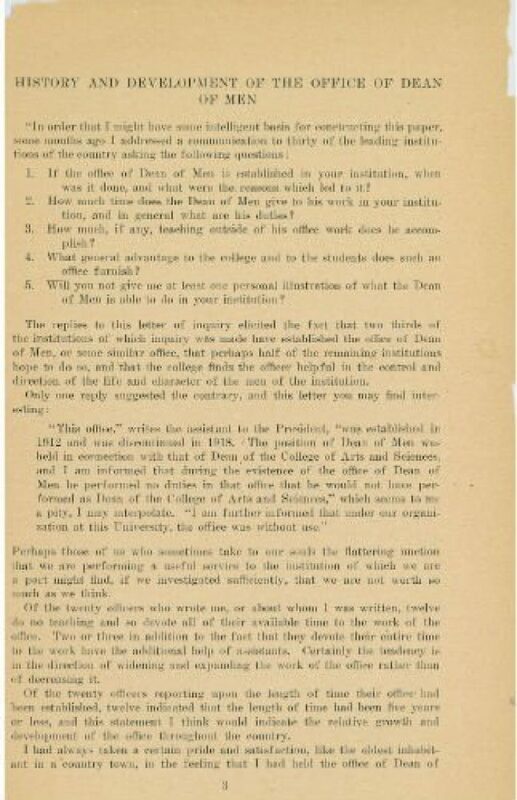 Robert Rienow, dean of men at the University of Iowa, writes a letter to Scott Goodnight, dean of men at Wisconsin, suggesting that a group of deans of men gather gather to discuss issues of importance to student personnel administrators at colleges and universities. Goodnight writes to Thomas Arkle Clark, dean of men at the University of Illinois to set the meeting in motion. The first six Deans come together. On January 24-25, 1919: Meeting of first six Deans/Faculty that becomes NADAM. Six men met at the University of Wisconsin, hosted by Scott Goodnight, the Dean of Men at the Madison campus. This meeting is recognized as the founding of NADAM which eventually became NASPA, though the group had no name or officers. Retroactively, Scott Goodnight became the first “president,” likely because he hosted the meeting. He was also elected president in 1927. These notes from the first meeting reflected agreement on a name for the new group. A future president of NASPA joins the group. Turner was working as a student clerk in Dean Clark’s office and ran errands for the 2nd meeting. Stanley Coulter joins the group. Coulter would eventually lead NASPA as president and was frank in his words. He was once quoted as saying, "The trouble with you boys is you take yourselves too seriously. You musn't do that." Some of the topics of concern are not so far from those we discuss today. DEANS TO CONSIDER STUDENT PROBLEMS Deans of Men from a dozen universities in the middle west and western states will meet at 9’o clock this morning in the board of trustees chambers, 354 Administration building, to discuss problems affecting student life and activities. The early gatherings were broken into “sessions”. Each session had two different attendees present on two different topics with open discussions after each one. Dean Clark explores why "deans" were established. Dean T. A. Clark delivered the History and Development of the Office of Dean of Men. The first Dean of Men office on record was established at the University of Oregon in 1878 by Dean John Straub. 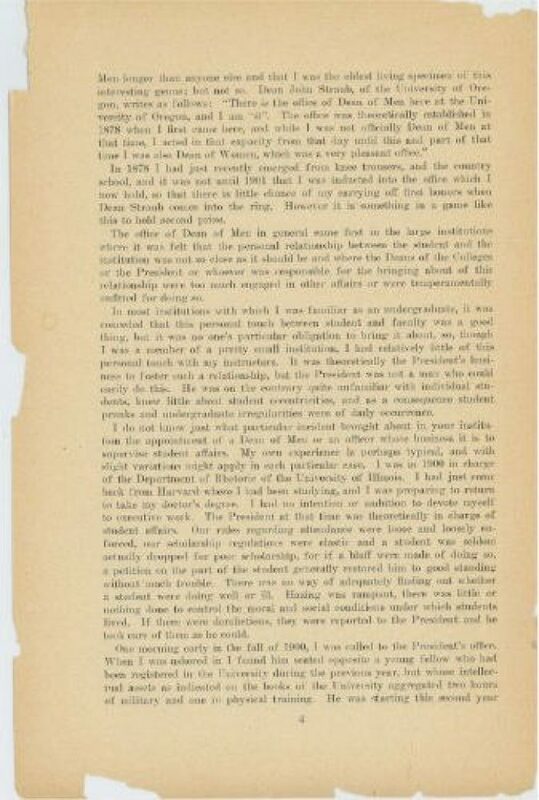 In these words offered in a welcoming statement by Purdue President Dr. Elliott, for the 1923 meeting, he sets the stage for the profession that would be student affairs. “The greatest practical problem throughout all of our education today is to provide treatment for each student as a separate individual who is taught and trained in terms of his own capacities and needs. Our institutions will be successful, not as smoothly running machines, but as constructive human agencies wherein each student is given a full chance to be what a properly educated person ought to be." 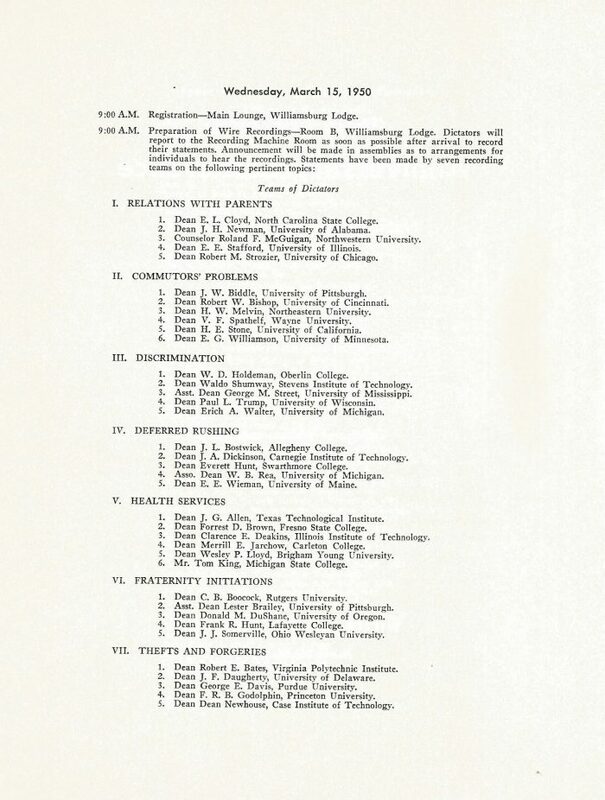 The 1924 conference was the first to include Assistant Deans, and covered themes that will be familiar to today's professionals. In these notes, you can read the discussion of how to increase civic engagement, how to make contact with students who "never get in trouble", and how much a student should expect from their personnel administrators. The first research paper to be considered by the group was focused on establishing data around exactly how many offices of Dean of Men there were and what duties were required of them. Anne D. Blitz of the University of Minnesota was the first woman to attend a NADAM meeting, as the guest of the host dean, E. E. Nicholson. Ms. Blitz was the Dean of Women. At the 9th annual meeting in Atlanta, the group agreed to impose $10 annual dues for all members. At the 10th annual conference, we hear from Dean Coulter on how he learned of his own job duties as a Dean of Men. The Conference of Deans and Advisers of Men adopts an official organizational name. 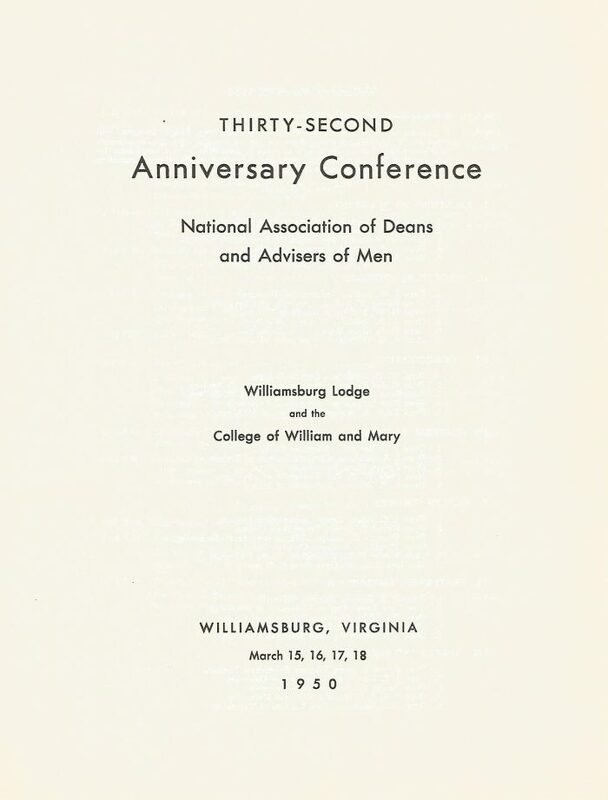 The organizational title “Conference of Deans and Advisers of Men” was modified and became the National Association of Deans and Advisers of Men (NADAM). This was the historical title of the organization until it became the National Association of Student Personnel Administrators (NASPA) in 1951. A "committee on policy" was established to discuss the needs and future of the National Association, as it had previously been a small, informal organization. With full support from the current president, the wives began holding discussion groups of their own during the annual conference. The president of National Association of Deans of Men set aside a time and place each year for the wives of the Deans of Men to hold a discussion group on the problems of the wives of the Deans and that it be recommended that the wife of the President each year direct the discussion if it is at all possible for her to attend. The association is compelled by a promise of strawberries to hold their annual gather in Arkansas. To bring annual conference to the University of Arkansas, Dean Ripley guaranteed to "provide all the strawberries you can eat" to everybody who attend this meeting. At the closing banquet, Dean Ripley prepared big dishpans filled up with ripe strawberries! Each Dean was given an empty bowl and a pitcher of cream and was told to help himself with all the strawberries! The first constitution clarified membership requirements for the association. Dean Gardner recommended the Association adopt a constitution. After discussing it article by article, the constitution was formally adopted by the Association. Before this constitution, anyone with a title of Dean of Men could join. The constitution clarified that the member's institution had to be a 4-year institution recognized by its regional accrediting agency. Each institution could choose who they wanted to represent them in the Association. With the adoption of a new constitution, institutional membership is formalized. “Institutional membership” is established as the basis for membership in NADAM. Each institution got one vote when legislation was considered or decisions needed to be made. An institution, however, could bring to conferences as many representatives as it wished to send. NADAM/NASPA’s first publication, The Counselor, makes a brief appearance, to be followed by many calls for publications. The Association adopts an official definition for its members. The challenge of assisting international students is brought forward. “The Problem of the Foreign Student” was presented by Charles D. Hurry, General Secretary, Committee on Friendly Relations Among Foreign Students. This is one of the earliest pieces we have that includes color - the cover of the 1934 newsletter. This is the first image available of a NADAM annual conference. At the 1936 conference, the members approved an honorarium of $100 for Secretary Fred Turner. At the 19th NADAM Annual Conference, W.H. Cowley delivered a speech titled “The Disappearing Dean of Men,” in which he predicted the emergence of the “dean of students” as the central officer of the future in student affairs. The Student Personnel Point of View is published by the American Council on Education. Though efforts were made to meet, the conference was not permitted to proceed. At the meeting on March 22, 1948, a proposed name change was discussed. The members discussed “the need for a title which more nearly describes the duties of the members.” None of the five proposed name changes included the word "men." In a vote, 23 agreed that the name should be changed. Sixty-three did not. At this annual conference, the group discussed joining with ACPA. Eighty-two voted to continue independently. Six voted to join. Revision of “The Student Personnel Point of View” emphasizing democracy, international understanding and cooperation, (a response to World War II) was published. For one session of conference, five “sections” were identified based on institution type and interests and attendees could choose from different options. NADAM had $800 in its coffers and conference expenses were estimated at $1,800 by Secretary-Treasurer Turner. The Executive Committee voted to take a loan from a bank to cover the costs. Howard University joins NASPA as the first HBCU member institution. Expressing the belief that education "encompasses the student's whole development"
The theme for 1953’s annual conference was “Working Administrative Relationships on the campus”. As a result of Fred Turner choosing to step back from this task, the Association asked Dean Arno Nowotny from UT-Austin to serve as NASPA Placement Officer. 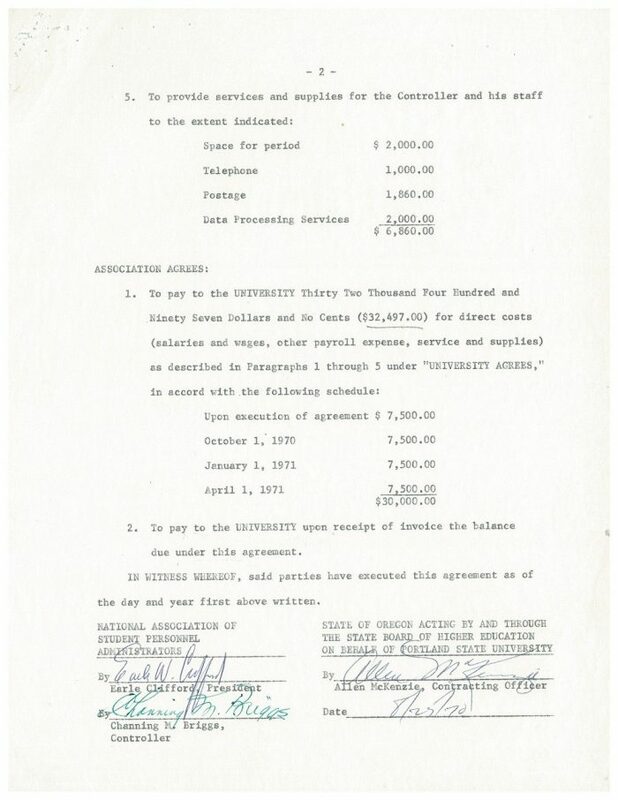 In 1956’s conference, the executive committee decided to change the previously uniform conference registration fees to $5 for members and $7.5 for non-members. The proposal that was put forth and approved created the role of the Conference Chairman. The Chair would need to be nominated by the Committee on Nominations and Place, elected by the members and serve a 3-year term. The commission on the Development and Training of Student Personnel Administrators received $40,000 funding for regional conferences from Carnegie Foundation. John E. Hocutt became the first conference chair of the NASPA annual conference. Mary Ethel Ball, Acting Dean of Students, University of Colorado, Boulder, was listed as an “institutional representative” in the roster of members included in a national conference proceeding. She was the first female member of NASPA. In 1958, Fred Turner decided to leave his role of Secretary-Treasurer after 21 years. Hazel Yates, Fred’s secretary for that whole period, was given a cultured pearl necklace. Fred was given a gasoline driven chain saw (for his cabin in Michigan) and $100 towards a portable television. Despite having just taken a step back the year before, Fred agreed to take on the role of NASPA historian. The original conference hotel refused to house African-American attendees, so leadership moved locations. The 1961 NASPA annual conference was originally scheduled to occur in Austin, Texas. However, when leadership learned that the hotel would not house African American conference attendees, they moved the conference to Colorado Springs where the president of Howard University was the keynote speaker. Commission VIII agreed to do a study “The Student and Social Issues" and petitioned the executive committee for support. The executive committee authorized the study and empowered the President and Chair of the Commission to contract with one of more foundations for financial support to conduct the study and publish the results. College Student Personnel Work as a Career was first published in 1963. The 2nd publication run in 1964 was 10,000 copies and about 100 were mailed every week upon request. NASPA was divided into 7 Regions, corresponding with the national accreditation associations. Region IV was further divided into East and West due to the large geographical expanse of that Region. NASPA Office was moved from Detroit to Portland State University. Channing M. Briggs, Dean of Admissions and Records for the university, was elected as the Comptroller of NASPA for the period July 1, 1970, to June 30, 1973. 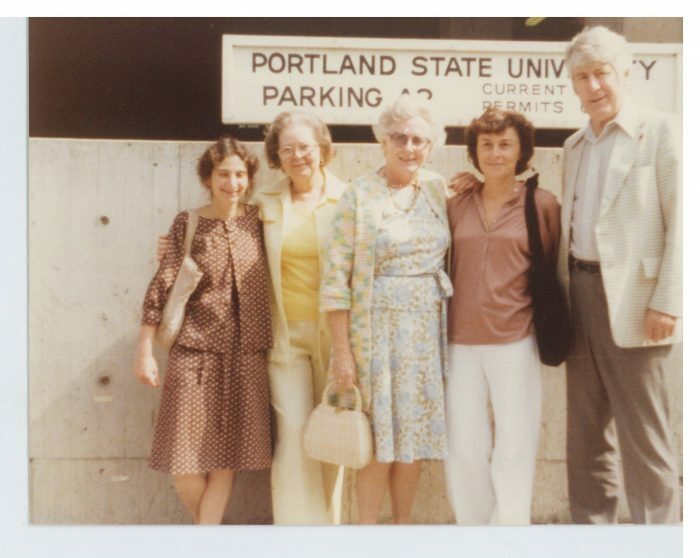 He was given authority to hire an administrative assistant and steno-clerk and the office remained at PSU with Briggs as head until July 1, 1981. A resolution was approved at the NASPA conference to “increase the active presence of minority groups within NASPA and within the student personnel field.” Carol Anderson, VPSA at Howard University, was appointed chair of a special committee. Alice Manicur of Frostburg State University was appointed to the NASPA Board to create a network of female colleagues and encourage their participation and membership in NASPA. Fred T. Badders, Dean for Student Development at Southeastern Community College, wrote a letter to December 17, 1971, to Suthern Sims, Vice President for Region III and Dean of Students at University of Georgia) suggesting the creation of a community college division. 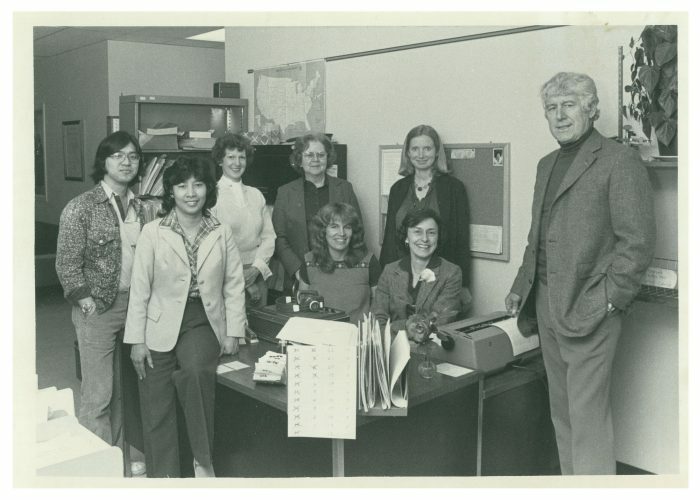 At the national level, the NASPA Task Force on Community Colleges was created by the Executive Committee to explore services for community college professionals (1972). The 1974 Conference was co-located with the conferences of ACPA and NAWDC. The organizations coordinated on placement services. Registrants could attend any session in the three conferences with only one registration. Lenore Cole of American University was the first woman and the first African-American to be elected a regional vice president (Region II). The NASPA Institute for Research and Development (NIRAD) was created during the presidency of John L. Blackburn (University of Denver). NIRAD was created to pursue issues in depth through research, consultations, and publications and would later become the NASPA Foundation. Wesleyan University becomes the 1,000th institutional member. Alice Manicur is sent to represent NASPA at the White House. Jim Rhatigan appointed Alice Manicur to represent NAPSA at a ‘Tuesday at the White House” on January 14. This was a series of meetings to offer various segments of society an opportunity to become more familiar with the major arms of government. Manicur asked Caspar Weinberger, Secretary of Health Education and Welfare to talk about Title IX and commented that more needed to be done to make students aware of their rights under Title IX, particularly women. Channing Briggs was the first paid, part-time comptroller of NASPA in 1970. In 1976, the title was changed to Executive Director. On November 14, 1978, NASPA was incorporated from the first time so that it would be legally protected against liabilities. George Young from Broward Community College was elected as the first community college president of NASPA. At the annual conference, there were 1,127 candidates, 410 employers, 712 positions, and 6,500 interviews. This peak would not be reached again for years. In accordance with its mission, NASPA’s first professional study abroad tour took place in October and made stops in Paris, London, Heidelbug, and Frankfurt. A group of 40 women that became known as the “good old girls” gathered in an unstructured meeting focused on the unique challenges of women in the profession. Two years later, the group would become the first official NASPA Network: The Women’s Network. The 5,000 member registered was Cheryl Altany-Straus from Florida International University. 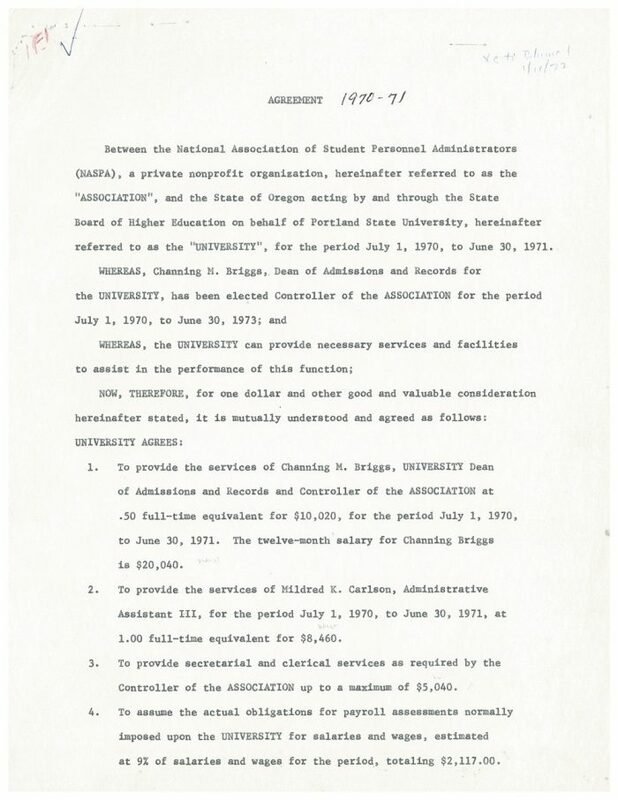 In May of 1980, the Association created an Equal Access – Equal Opportunity Coordinator position to facilitate access to positions in NASPA for underrepresented groups. The Executive Committee voted to hire an Assistant Executive Director to be house in ACE’s offices in Washington, D.C. with the task to disseminate pertinent information on legislative issues and other critical concerns affecting Chief Student Affairs Officers and the profession. Richard Stevens, VPSA at the University of New Hampshire was appointed to the position. The Ohio State University was chosen among several options by a vote of the membership. Staff to be stationed at OSU included the Membership Secretary, Administration Associate, Communications Editor, NASPA Secretary, and Executive Director. By October, all membership and financial records were transferred to computer for the first time. The 1981 conference was originally scheduled to take place in New Orleans but Louisiana hadn’t yet ratified the Equal Rights Amendment. The conference was moved to Los Angeles, even though venue contracts had already been signed. At the 1982 conference “a very important resolution about ethnic minority participation in NASPA was passed. Ethnic Minority Caucus had been active for a while. Resolution sought the following from NASPA: 1. NASPA develop a task force to assess needs of ethnic minority membership as they relate to PD; 2. NASPA seek to increase the representation and participation of ethnic minority professionals at all levels of the assoc, 3. NASPA continue to develop and support minority awareness programs at state, regional and national levels, 4. NASPA develop and support an ethnic minority communication network at all levels, 5. NASPA develop and support a national directory of ethnic minority with membership in NASPA which designates those ethnic minorities who are CSAOs, and 6. NASPA communicate with HBCUs to support and promote their participation in NASPA. From this Ethnic Minority Network was developed through work of Member at Large,Joyce Gibson. NASPA’s Networks were the precursor to today’s knowledge communities and divisions. In 1982, the Small College Network was formed. The legal drinking age in the U.S. was raised from 18 to 21 and campuses were concerned about how they would enforce the change. An interassociation task force that included ACPA and ACUHO-I was formed to work on campus issues and alcohol education programming. NASPA was also collaborating with BACCHUS at this time. In February, NASPA adopts guidelines for campus marketing of alcohol. The executive committee agreed to commission Chet Peters of Kansas State University to carve a gavel for each new NASPA president.This began the tradition of the creation of a customized gavel for each NASPA president. Professional Affiliate: $35 Faculty Affiliate $35 Associate Affiliate $75 Student Affiliate $15 Institutional dues were based on FTE enrollment and total expenditures with a cap of $150-$710. International institution dues were $175. The Dissertation of the Year award was renamed in honor of Melvene Hardee. The NASPA/ACE Summer Institute was renamed the Richard F. Stevens NASPA/ACE Institute after he passed away the prior year. NASPA and ACPA held their first joint conference in Chicago. The year was the 50th anniversary of the Student Personnel Point of View. The conference theme was “Make No Little Plans: Celebrate our past, design our future”. The Washington Higher Education Secretariat is a group sponsored by ACE, to carry out the principle function of assuring coordination and cooperation among numerous higher education related associations. These words were added to the NASPA constitution: NASPA does not discrimination on the basis of race, creed, gender, age, national origin, sexual orientation, or physical disability in the administration of its policies on membership, programs, services, publications, and employment. After being proposed the prior year, NASPA formed a task force on gay, lesbian, and bisexual concerns in response to homophobic incidents and the AIDS epidemic. President Tom Goodale first identified creating a funding the Minority Undergraduate Fellows Program. In January, the IRS officially designated NASPA as a 501©3 nonprofit organization. In a restructure of task forces, networks and advisory groups, the following networks were approved: new professionals, small colleges, fraternities and sororities, ethnic minorities, gay, lesbian, and bisexual, urban institutions, women in student affairs, adult learners, and community colleges. NASPA’s Minority Undergraduate Fellows Program began in fall of 1990 and was piloted for three yeares in Regions II, IV-E, and IV-W.
MUFP advances from pilot phase to all 7 regions. Kevin Kruger is hired as the Assistant Director of NASPA. The NASPA diamond first appears as part of an official logo. Gwen Dungy hired as Executive Director. In 1995, Gwendolyn Jordan Dungy joined the Association as the Executive Director. It was under Gwen's leadership that the Association expanded professional development opportunities, created the Knowledge Communities, and diversified the organization's publication offerings. NASPA conducted its first online membership survey and NASPA drew an almost 90% approval rating. Civil rights activist Morris Dees, co-founder of the Southern Poverty Law Center, was the keynote of the annual conference. NASPA Journal moves to an electronic format. Leadership Exchange, a quarterly magazine focuses on critical issues of relevance to senior student affairs officers and provides an additional forum for discussion and information sharing. In July, the NASPA board of directors unanimously approved the renaming of the National Academy for Leadership and Executive Effectiveness in honor of past president, James E. Scott. First Small College Institute is held. NASPA President Mike Segawa and ACPA President Tom Jackson, convened a task group to discuss professional standards and competencies in student affairs. The group was chaired by Marilee Bresciani, Director of NASPA’s Professional Standards Division, and Dwayne Todd from ACPA. Dr. Jan Walbert was invited to testify on issues of college safety by the US Department of Labor.